What is Net Promoter Score (NPS) and what insights does it offer? Your Net Promoter Score is a metric used by businesses to asses how likely it is for a customer to recommend your business to their own network, whether that be professional or personal. A high NPS means your customers are more likely to turn into active promoters and brand advocates for your business – happy to wax lyrical about how great you are. A low NPS means your customers aren’t completely happy with the service or products you provide. As an e-commerce owner, having a full view of your NPS score is vital if you want to grow your business, improve customer loyalty and in turn, increase revenue. Keeping your customers happy isn’t simply a by-product of running a business. It’s supposed to be an active, deliberate exercise you do fuelled by specific processes. Keeping your customers happy isn’t simply a by-product of running a business. It’s supposed to be an active, deliberate exercise you do fuelled by specific processes. When you have access to your NPS data, you’ll gain significant insight into how your current marketing efforts are at not only acquiring new customers but retaining them too. As we mentioned, to calculate your NPS, you need to ask your current customers how likely they are to recommend your company or product to friends or family. You’ll want them to give you a number between 0 and 10. Without taking industries into account, any NPS above zero is good, above 50 is excellent and if you have one above 70, you’re doing something really special. What counts as a good NPS? When your NPS is high, both you and your customers will feel like this. But when it’s low….well it tells you there are things that need to change. It’s important to note a “good” NPS score is relative to specific industries. As a customer experience metric, you need to understand that there’s no one-single-factor that goes into people’s opinions. Someone might recommend your store to their friend because they loved the quality of the product. Another might not recommend your store to their friend because shipping took too long. The point you need to understand is because there are a range of influences that go into your overall NPS, it’s hard to say a great deal about any company by only looking at their NPS without considering the performance within the industry. In some industries, 25 could be the worst in the industry, but for others, it could be the market leader. So what can you actually do with your NPS score? Well not only does it tell you what your customers think and feel about your service, but it also shows you how you compare to your competitors. A number by itself doesn’t tell you much so adopt a relative method whereby you compare your NPS with the average scores within your industry and against your competitors. This approach differs from the absolute method which involves comparing your number to an agreed standard. The first benefits of improving your NPS is greater loyalty. The more parameters you have within your company, the more likely it is that someone will recommend your brand to their friend or family. Second, increased retention. Your customers like to see that you’re not only open to hearing their feedback but happy to work on their requests and close that feedback loop (more on that later). Product feedback and improvement. Your customers will tell you what they like and dislike about your products or business. What’s more, you’ll often come across trends and patterns. Use these trends and patterns to improve your existing offering. Finally, reducing customer churn. You can use your NPS feedback results to establish which customers are at risk of churning before it happens. Only thinking about your Net Promotor Score without any thought to the rest of your customer experience is a grave mistake. Your Net Promoter Score focusses on customer loyalty. Whereas customer experience needs to incorporate the entire customer journey. The benefit of NPS is that it gives you both qualitative and quantitative data to assess. When you combine qualitative and quantitative data, you’re able to better think about the voice of the customer and use that to make changes to your design based on feedback to reflect newer, desired positive exeperiences. 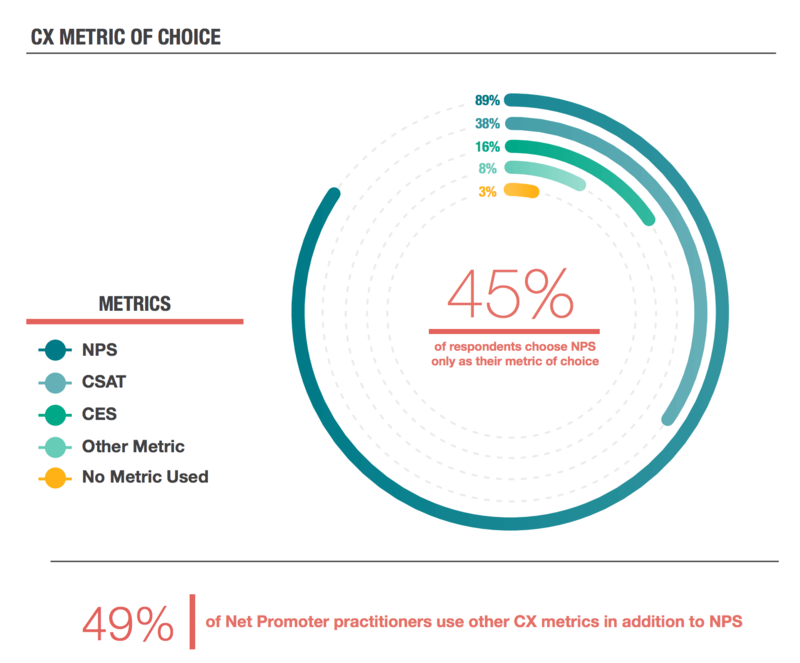 Although 45% of respondents in a recent survey chose NPS as their metric of choice, other metrics are also used like CSAT, CES and more. So the optimum is to use your NPS as your starting point, as part of a larger customer experience optimization exercise. And the best way to do this is to stop using NPS as a standalone metric and start looking beyond the number to establish key insights about your customers. Let’s say you know your NPS is higher than your competitors. Initially, that’s great news. But if your boss were to come to you to ask you what specific changes you’ll make in order to keep our NPS position, what would you say? You’d be uncertain. Because by itself, NPS isn’t all that useful a metric. But combined in a wider customer experience programme, it has the power to increase brand loyalty, decrease retention and provide you with the feedback you can use to improve your business or product. Boots UK, a cosmetic retailer, has an NPS of 24. But compare that score to Warby Parker, the sunglasses retailer. They have an NPS of 80. Do you think it makes sense for Boots to compare their efforts to Warby Parker? No, because they operate in different industries with different customers. If Three really wanted to see how they stacked up they should compare themselves to other cosmetics providers. When you have a clear idea of why your NPS is what it is and how it affects your overall customer experience, you’ll be better equipped for making changes. These changes could take any form from crafting better customer-centric experiences to improving product features on your website an app to support that experience. Where some e-commerce companies go wrong is assuming that NPS’ value comes from the number. At the end of the day, your NPS score is nothing more than a vanity metric. The true value comes in the qualitative feedback you get from it. Because it’s with this feedback that you can make sure you’re continually improving your customer experience. 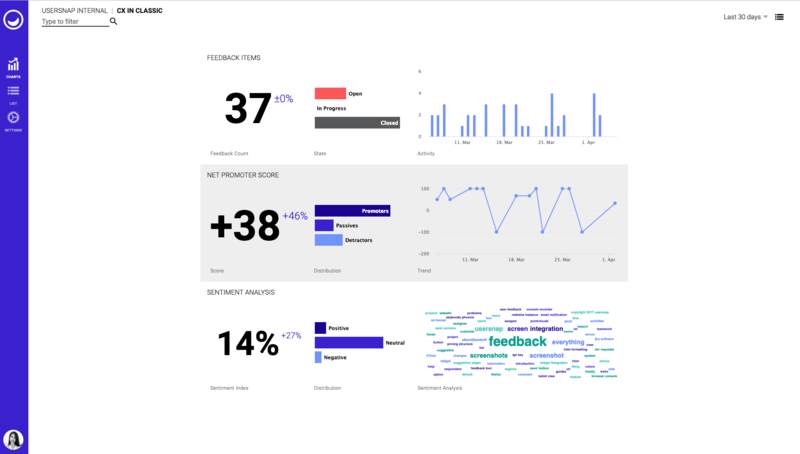 When you begin implementing NPs to your CX stack, it’s important to choose a tool that allows you to not only collect quantitative feedback but follow up on your score to gain additional insight. 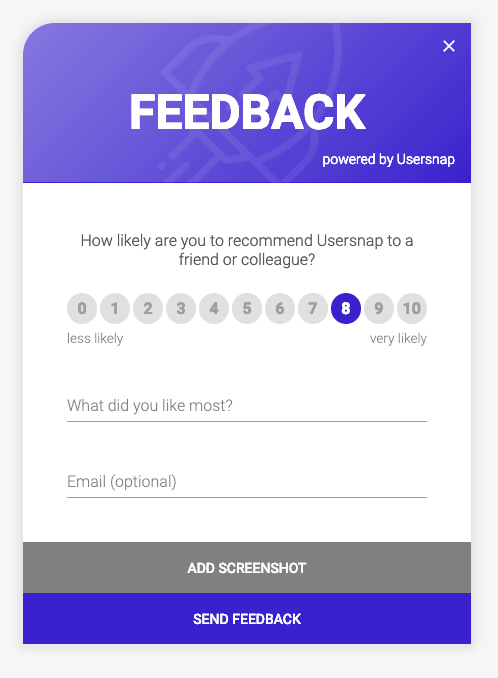 At Usersnap, our NPS tool allows users to comment directly on their feedback providing a qualitative response too. 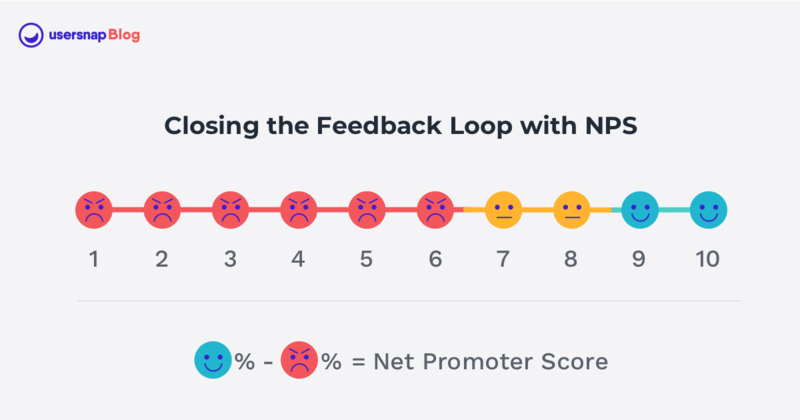 In the 2018 NPS benchmark report, companies who failed to act on feedback and not close the loop saw a 2.1% increase in churn. So the best way to start using your NPS to make real change is to stop positioning the question as ‘What is a good NPS?” and instead think about what causes the score to be how it is. Remember in the world of e-commerce, there are a number of different factors that could turn a positive experience into a negative one. A customer might be completely happy with the product but because shipping too long, they rated it a one. For this reason, if you want to make NPS useful, don’t just look at the numbers, instead focus on the comments – especially your detractors to identifying flaws in your marketing, sales, payment and order fulfillment processes. As NPS is a volatile metrics, make sure you focus on trying to close the feedback loop based off of the issues your customers report to you. This means you need to take action or respond directly to a customer’s concerns (and praise). You’ll want to incorporate this feedback into your products as this will have a much stronger effect on your entire e-commerce business than just repeating your NPS survey to get a higher score you’re pleased with. No matter what stage your e-commerce business is at, you need to make customer experience a priority – especially if you want to grow and keep your customers happy. If you don’t gather insight from customer feedback, or act on it when you do have it, you’ll send your customers straight to your competitors. To make the best use of NPS, though, remember to use it within a framework of customer experience and not as a standalone metric. Improving your customer experience is an invaluable task you can do for your business. Remember, any change should be continuous and you’ll open yourself up to the possibility of extreme growth, product success and enhanced customer loyalty. Usersnap for Customer Experience Management is currently in beta testing and we’re looking for forward-thinking companies to demo our service. If you want to drive more sales based on qualitative and quantitative data to help you make better business decisions, sign up for a free demo today!